Don't rely on Jedi mind tricks to accessorize your Star Wars Halloween costume, add this Anakin Lightsaber and show you mean business! The authentic Star Wars accessory is a replica of the one Anakin used in the movies. A blue plastic “blade” can be pulled out from the inside of the handle and measures 3 feet long. When you push the power button, the blade lights up (requires two AA batteries NOT included). 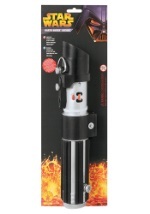 Stop Palpatine's ascension to power this Halloween with our Anakin Lightsaber. Add extra detail with our other great accessories, like an Anakin glove!